I have had some conversations related to this during the last months. So many companies/start-ups are opening ICO processes to fund their blockchain business. They create a business plan with a budget to fund it, the currency is in dollars/euros or other FIAT currency. The majority enable the investors to fund the project with crypto-currency, mainly bitcoins or ethers. (It would be ironic that a company based on the block-chain will not trust the 2 main block-chain coins, right?). The point is that the money they have raised is to fund the project that is based on real cost needs: salaries, equipment, other services. The majority of the services are paid in FIAT, so you are obliged to sell these coins in the market and then use the money for your business plan. How many of these “sells” are provoking the market to bear? Is there a real impact on the market? 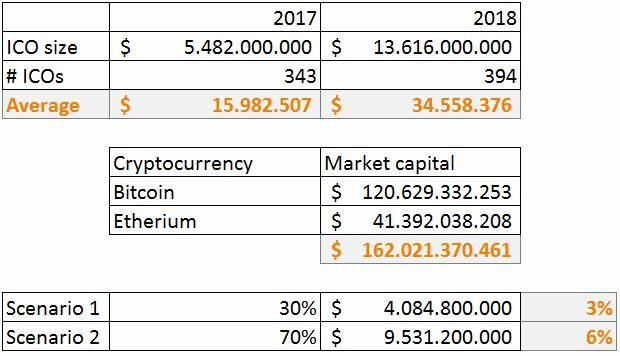 I have used the data from https://www.coindesk.com/ico-tracker/ to do some basic math of the situation, and this is the result. Take only in consideration the number of ICOs from 2018, as the ones for 2017 are already cashed in FIAT. that the companies only enable to fund with Bitcoin and Etherium (data taken from https://coinmarketcap.com/ on August/2018). Scenario 1: 30% of the collected money is done in crypto-currency. Scenario 2: 70% of the collected money is done in crypto-currency. Ok, the analysis is very simplified, and there could be a lot of bias on it. But at rough estimate it looks like the impact is very low even if a high percentage of the collected funds comes from crypto-currencies. On the other hand it’s a good bunch of dollars, isn’t it?